Change isn’t always easy because change requires us to do something different than what we comfortably are accustomed to. One thing I have learned is that change is going to happen no matter what, it’s just a matter of time of when it happens. When you see change happening – either at work, your personal life, the economy, or in business – you have a choice to adjust to the change and progress with it or you stay stagnant. 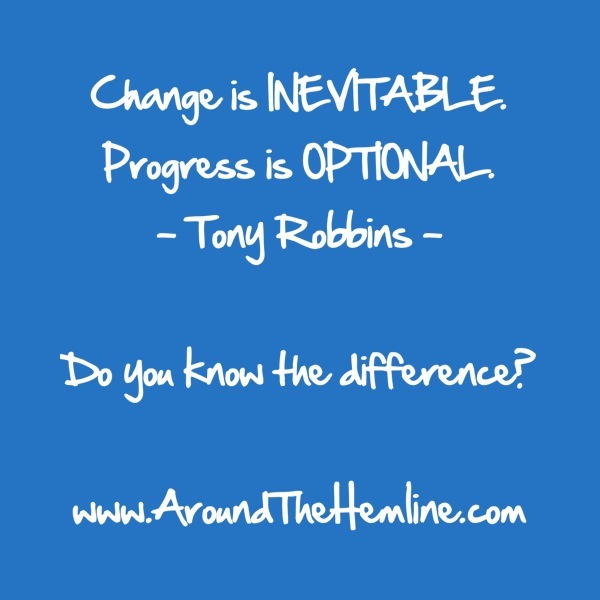 There IS a difference between succumbing to the change or adjusting to the change. For instance, a change could be your company deciding to start cutting back on expenses and lays employees off. This change may bring you more work for you. You necessarily do not have to like the change but you can progress with it. Consider the change as an opportunity to prove that you can handle the extra workload and show the company that they did choose the right person to keep! You can create ways to become more efficient or have the ability to suggest more change that works for the change. When you attempt to make a change, it may not work the first time. Since life is about trials and errors, you continue (or should continue) to find a system that works for YOU. But one thing is for sure, never stay put and refuse to chose the option to progress, you will get left behind. Be flexible and be creative to accept the changes whether the changes are self changes or societal changes. Choose to progress!! It�s suitable time to have the plans money for hard times and it�s time to be happy. We’ve read this publish and if I really could I want to advise you number of interesting things or guidelines. Maybe you may write up coming articles discussing this article. I would like to read more aspects of it!